Today I’m sharing this Moroccan-Inspired Thank You card printable in a classic modern quatrefoil design. There’s something about sending (and receiving) a thank you card and this makes it easy! Before we leave on our next vacation, I’m popping a handwritten note over to a neighbor. While writing my thank you note, it got me thinking how little I write letters anymore. Do you remember writing letters for handwriting practice? Pen pals? Writing to the soldiers stationed overseas? Now, we get eCards and pop over a quick text but I really think there’s something to writing out a sentiment. Maybe it’s because I attended finishing school and writing thank you notes was kind of a 100 level class, if ya know what I mean. Handwriting can be classified as ‘vintage,’ right? And everything vintage gets a renaissance. Obviously, my sardonic side is showing through, but keyboards are now the norm. Generations of the future aren’t going to be able to read your grandmother’s journal in 20 years because it’s going to become just a series of symbols soon. Is cursive the modern times’ hieroglyphs? With schools adopting the paradigm shift and eliminating handwriting (cursive), if you want your kiddo to know how to connect letters, you’ll have to go back to teaching them on your dining room table. Our dining room table is ready. 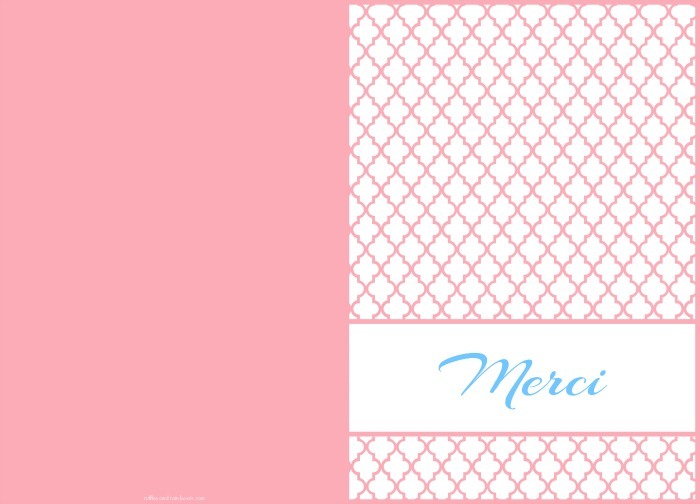 And so are your Moroccan Inspired Thank You card printable (in French and English). I’ve created a workbook for each and every month of the year, allowing you to practice 3 hand lettering styles each month! They’re gray-scale, so you can work on writing without having to guess if you’re getting it right. Check out the fun on the Hand Lettering resource page. Print off these quick cards. If you’re looking for more printables, check other printable cards we’ve made available here. If you found this useful, would you please share it on Facebook or pin it to your favorite board on Pinterest? Your shares are how we grow and we are sincerely grateful. I’m not back quite yet but getting back there. :) You are so correct. I find myself just sending ecards and texts a lot but I think it means so much more when you either make the card or buy it in store and write out your sentiments. I am loving this printable one. Love the colors and I’m sure your neighbor would appreciate it.